Here is an admirable specimen of Picris echiodes, wrapped up in a package which celebrates both beauty and strength. She is set amidst the unyielding erect pointed thorns of the wintering tumbleweed, and she, a single flower, stands proudly. She occupies the spot of feminine beauty in a male dominated world. She is bright and alluring, yet confusing. She has the power to attract, with her brilliantly becoming yellow, but her thorns underscore the risk involved in getting close to her. What grows among the tumbleweeds is no delicate fancy flower, but one to be respected and listened to. She is a powerful force, confident in herself and in her duty. It would be a mistake to take this flower lightly. She stands out from the crowd because she is stronger than the forces which seek to make her bend. So do not be surprised when the beautiful among you draw upon their inner strength to be much stronger than imaginable. 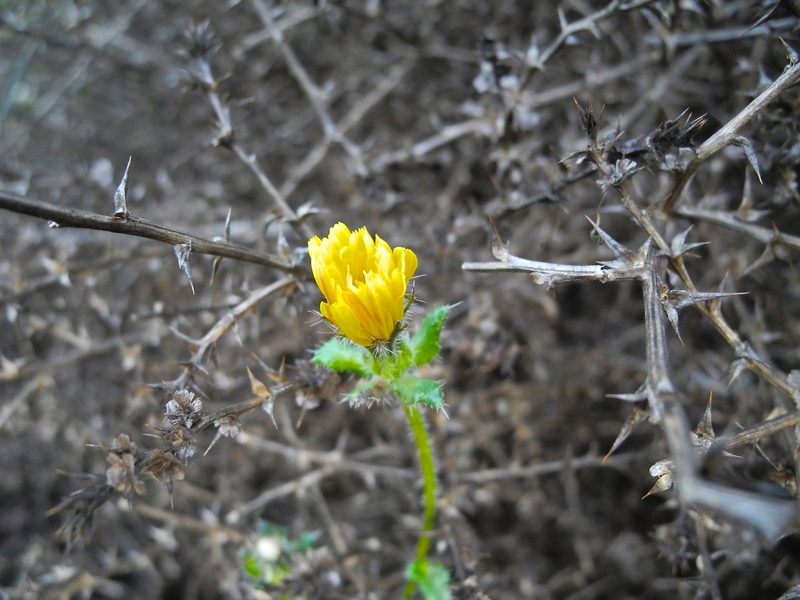 And if you see thorns, be happy she cares enough to warn you of her indomitable spirit!